The concept of Daylighting has been discussed over the last 10 years. In 2009 the City received a grant from New York State Economic Development allowing the engineering to be commissioned. 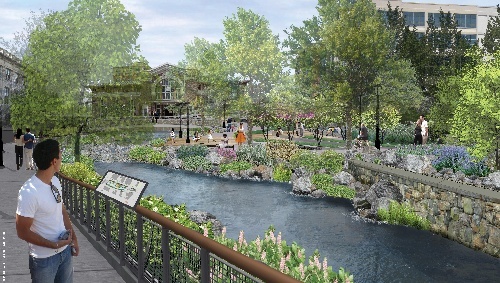 Once completed The Saw Mill River Daylighting at Larkin Plaza will be one of the most significant habitat restorations in the country in terms of its ecological, economic and cultural impacts. Comparable projects are rare and none have been done in the United States. The daylighting includes the creation of a natural habitat for migratory fish passage focusing on American eel, white perch, and herring that will migrate into the open ponds and rest in the riffle areas. Native vegetation will serve to attract insects and will encourage food chains that will help sustain the aquatic life and will also serve too maintain water temperatures conducive to the life in the ponds. The resulting economic development and job creation anticipates that approximately 950 permanent jobs will be created within 5 to 10 years as a result of the project. Click here to see full mission statement. © 2011-2 Yonkers Downtown Waterfront Development Corporation. All rights reserved.